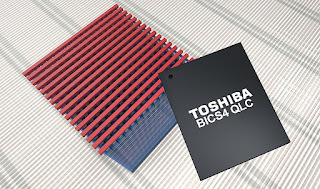 Toshiba Memory Europe has developed a prototype sample of a 96-layer flash memory chip using its proprietary 3D flash quad level cell (QLC) technology. QLC allows four bits per cell and the prototype jointly developed with Western Digital Corporation stores 1.33 terabits on a single chip. This also allows 2.66 terabytes in a single package through a 16-chip stacked architecture. The progress in IoT and the demand for analysing and using that data in real time is expected to increase dramatically and this will require even faster HDDs and larger capacity storage from such schips says the company. Toshiba Memory will start to deliver samples to SSD and SSD controller manufacturers for evaluation from the beginning of September and expects to start mass production in 2019.